I added a "secret" ingredient to my red pepper soup and . . . it's incredible! Amazing what a little sweet corn can do . . . ! The recipe title is officially "Roasted Red Pepper and Corn Soup" -- care to test? Email me! ~ First, I finally sucked it up and tested my roasted red pepper soup for the cookbook. It's very, very tasty, but the roasted red pepper taste is not as strong as I thought it was going to be. I'm going to let it sit in the fridge overnight, and try it again tomorrow -- perhaps I will feel differently then! ~ Then, I made Isa's tempeh bacon from VwaV! This is also quite good. I could not find liquid smoke at the co-op, so I added four dashes of Tobasco and two dashes of ground cumin to the marinade for some added smokiness. I made a killer sandwich on spelt bread with the tempeh, Vegenaise, romaine, tomato, and mashed avocado. Mmmmmmmmmmmmm!!! My first tempeh attempt was a huge success! ~ Last, I retested my pumpkin dip for the cookbook, using slightly different ingredients. It was really runny when I finished blending it, but a trip in the fridge thicked it nicely. I'll have to cut up an apple tonight and test it out! I am spending the rest of my weekend house-sitting, which is fantastic! Free air conditioning!!! Tonight, I finally saw "An Inconvenient Truth." Parts made me so angry, I thought I was going to start crying or throw up. I'm still mentally digesting -- more may come over the next few days. Take everyone you know to this movie, even if you have to pay for their ticket and drag them in kicking and screaming. 1. This was my first time ever using vegan cheese (Follow Your Heart Mozzarella), and it worked out pretty well! I shredded the whole package, then split it in two and froze half for another day. (I hope this works.) It melted nicely in the oven, then I broiled it for about a minute and a half to brown it. It does taste pretty good, but it doesn't hold a candle to the real thing. Alas. 2. Inspired by some reading I did in a food magazine, I made a "special sauce" for my pizza -- half canned pumpkin and half Muir Glen organic fire-roasted tomato sauce, with a few dashes each of garlic salt and Italian seasoning to punch it up a bit. For someone who doesn't much care for tomato sauce on her pizza, I REALLY like the pumpkin-tomato combo. You can't taste the pumpkin at all -- it's just not as intense as traditional tomato sauce. (Maybe good for kids, too?) A sneaky way to get orange veggies into my diet! I'm almost finished with my second piece, and I may need a third, it's that good! What do you think of "Sneaky-Pete Pizza" as a potential recipe title? I am having the greatest breakfast this morning: homemade granola with soy milk, topped with fresh, local, organic blueberries! Yum. These blueberries are SO fantastic! In other food news . . .
~ I finally, finally, finally have a clean kitchen as of last night, so I can begin messing it up again tonight. I hope to make an awesome dinner! What it will be, we'll see, however. ~ I'm thinking about buying a rice cooker sometime in the near future. I have a complete inability to consistently cook rice well on the stovetop, and the family I nanny for has a rice cooker and I sort of love it. ;-) Anyone else out there have feelings about a rice cooker, one way or the other? ~ I'm thinking about adding the directions for making cold-pressed coffee to my cookbook, since I seem to have perfected the technique. Any thoughts? ~ I really hope to devote a lot of time this coming weekend to working on the cookbook -- recipe testing, writing, editing, etc. Here's hoping the weather cooperates! I'm tired of temps in the high 90s, because then all I want to do is sit around and try not to sweat too much. Whew! I can't believe it's Sunday afternoon already. This post will be nearly food-free, because I've been ultra-naughty this weekend and have eaten out once on Friday, once on Saturday, and once today! I'll post restaurant reviews on Veggin' Out, though! Saturday morning, Ann and I drove out to visit our friend Janelle and her new baby boy, Luke Jeffrey! Janelle looked great and Luke's a super-baby -- he's a good sleeper and very mellow. I held him for about a half an hour and he never fussed at all! (Usually, I have the "screaming effect" on tiny babies -- the, "you're not my mom, give me BAAAAAACK!" effect.) Ann and I stopped at Holy Land for lunch once we got back into town . . . mmmmmmm falafel. I've been craving falafel for months . . . finally! Saturday evening, I hung out with my friend Dan -- we had tickets to the Tapes 'n Tapes/Plastic Constellations show at First Ave, which did end up selling out. Whoa! Before the show, we went and wandered around the wildflower gardens and bird sanctuary at Theo Wirth Park -- I'd never been there before and it was really, really cool. We saw what appeared to be a groundhog to me, although Dan thought it was a gopher. (I swear gophers are way smaller than this furry creature we spotted.) The only tricky part is that the park closed at "dusk," which is a rather relative term. :) What happens is, when the naturalists decide it's dusk, they lock the gates, which locks everyone inside the park! Then they walk the trails and flush everyone out, and so we headed uphill and had to stand around in the heat, swatting at mosquitoes, while we waited for the naturalists to finish walking the trails and let us out! It seems like a silly process to me. Oh well. Anyhow, the show was mixed -- Tapes 'n Tapes were awesome, but I didn't care for either of the two opening bands. (The rapper was particularly awful.) It was so hot and so crowded at the end of Tapes 'n Tapes, Dan and I took off and completely skipped Plastic Constellations. Oh well -- Tapes 'n Tapes were fully worth the $8 ticket! Their drummer is incredible -- just a baby (I think he's, like, 19,) but unbelievably talented. They were a fun band to watch -- they all jumped around and danced a lot and generally had a good time. We had a great spot and I could see everything, but thank God for earplugs -- we were almost right next to the speaker! This morning I watched "Rushmore," which I thought was hilarious! Then, Ann and I walked around Lake of the Isles and had lunch at Salsa a la Salsa. It's been another very busy, but very fun weekend! I'm enjoying the fact that my job is so much lower stress now I actually have energy to do fun stuff over the weekends! Hooray! Here's hoping I actually do some cooking this week, and thus return FOOD SNOB to an actual food blog! Christine and I forewent the art show in favor of grocery shopping. A sad Friday night choice, we realized, but we both were starting to feel a little like Old Mother Hubbard! This list looks enormous, but note I saved $22.14 between coupons, member specials, and a bag refund! Go me! In other news, I'm trying to cut back a little bit on soy, and was excited to find a rice-soy blend milk in the soymilk aisle. I'll let you know how it tastes! I'm also trying a little bit to explore new grains, thus, the spelt bread. Visit Harmonia for more info on Midweek (Weekend) Munchies. We had so much fun at the show tonight! Chris Koza, who if you haven't heard of him, is a highly acclaimed local artist -- check out the link WAY down on the right. He plays folksy rock, and has two CDs out. He is talented enough to play the guitar and harmonica at the same time, (and as Christine added, "well, so did Bob Dylan," but I continued, "well, since I don't have the talent for either, I'm impressed! ",) and has both the ability to write beautiful ballads and rock your brains out. The location was superb as well. The show was at the Mill City Museum, in Mill Ruins Park -- an outdoor space surrounded by ruins from the old flour mill that burned down eons ago along the Mississippi River. So, so cool. I definitely want to go back and check out the museum sometime -- it supposedly chronicles the history of Minneapolis. Christine went with her dad when he was in town, and she said it was pretty cool. The people-watching was also spectacular -- I've never seen more thong-buttcrack coupled with "muffin top" flab in one sitting before. Sheesh. Pull up yo' pants! My only complaint? Sitting on rubble for a two hour concert -- my tushie was numb by the end of the show! We agreed -- next time, we'd each bring our "chair in a sack." This weekend is shaping up to be pretty busy for me. I may go to an art show tomorrow night, and then on Saturday, I am planning on visiting my friend Janelle, who just had a baby. Saturday night . . . Tapes 'n Tapes at First Ave! Wooooo! And man, I have to make time to get to the Wedge. SO, if you don't hear from me, have a great weekend and I'll post about all of the insanity on Sunday. Some friends are picking me up straight from work tonight and we are headed to an outdoor concert, so I packed a dinner in my Laptop Lunchbox because I know I won't make it until 8:00 without something to eat. It's the saddest "dinnerbox" ever -- a sunbutter and strawberry all-fruit spread sandwich, grapefruit segments, baby carrots with hummus, and a couple bites of "tiger chocolate" (dark chocolate with espresso beans.) I really, really need to go grocery shopping. Here's hoping I can make some time to do that this weekend! P.S. About the Laptop Lunchbox . . . if you are a long-time visitor to my blog, you know how much I love it! However, my only complaint to date is that a sandwich really doesn't fit in the container that's designed to hold a sandwich. This was never much of a problem for me, because I'm not a huge sandwich person. However, I think I solved the problem today -- I just took the sandwich-sized container out of the lunchbox and tossed the sandwich in the bottom of the box. The few extra milimeters of space seem to have solved the sandwich smush problem! Awesome. P.P.S. The heat has finally broken here -- mid eighties during the day, and temps dropping into the sixties at night. Whew! I guess the only thing that's good about the heat is that I'm getting enough fruit servings every day. In other news, I had another voice lesson this morning. They are lots of fun and going exceptionally well. My director is impressed with the gains I've made in the four lessons we've had. Today, he decided that my voice coupled with my instinctual ability to phrase beautifully means I should be singing more than once a week. (I'm not quite sure yet what this means.) He's going to "think it over and look into options." Interesting. I always knew I could sing well . . . didn't know I was this good, however! I'm so very excited about this -- can't wait to see what Bill drums up. There is an article in my most recent issue of Eating Well magazine (the Aug/Sept. issue,) titled, "Organics: Are They Worth It?" It summarizes much of the research comparing organic to conventional produce, mentions a few other issues associated with organics (buying local produce over far away organic produce because it had to travel much less, and is thus better for the environment, even if it has some pesticide/herbicide residues on it, etc. ), and has a handy chart at the end titled "Where to Put Your Money." (It lists produce in three categories: "Preferably Organic -- Most Commonly Contaminated," "If Budget Allows, Buy Organic," and "It's Your Call -- Least Commonly Contaminated." The article is very, very interesting, and if you can get your hands on a copy, read it! Well, I cleaned out my fridge today. That was a major bummer -- due to the heat and my complete lack of interest in cooking this week, I had to throw a few (ahem) things away. I hate, hate, hate throwing out food. I also noticed that many of my herbs and other fresh produce need to be used up soon, so I decided to cook myself some dinner tonight. I sauteed a thinly sliced shallot, four sliced mushrooms, a minced clove of garlic, and half a zucchini, sliced, in a big glug of extra virgin olive oil until they were all soft, then stirred in two seeded, roughly chopped tomatoes a small handfull of mixed herbs, minced (parsley, basil, rosemary, and thyme,) some salt and pepper, and a package of gnocchi that I had boiled until they floated up, just like the directions told me to. Voila -- dinner in under fifteen minutes. These little potato dumplings will definitely be a repeat visitor to my kitchen! Three cheers for the Sprite melon! My kit-cat is totally passed out on my table right now -- all stretched out flat to absorb as much coolness from the hard surface as he can. What a goon. I feel sorry for him -- it must not be fun wearing a fur coat in 90+ degree heat! My refund came from Seventh Generation today, and the kind lady included an additional sheet of four $1 off coupons! If I had any doubts about Seventh Generation before, they have since been squashed flat. What a wonderful, wonderful company. Happy Friday, folks. Enjoy your weekends. If it's helluh hot in your neck of the woods, stay cool. So, I tried out my brand-new "granny cart" today! I hauled my dirty clothes to work this morning, and hauled them home clean tonight! It is a great new thing. One less selling the car obstacle! I think it will make walking to the grocery store MUCH more pleasant as well. However, due to the heat, I will have to start bringing a cooler with me, at least until October or so. :) The actual air temperature is supposed to hit 100 degrees on Saturday! IT IS NOT SUPPOSED TO GET THIS HOT IN MINNESOTA! It's been WAY too hot to cook lately, and even too hot to eat -- I had a smoothie, banana bread, and ice cream for supper last night. Sad. She also gave me a kiss on my back today because I told her my back was very sore. She then said, "buh-bye, owwies!" It was cute. Ineffective, but cute. ~ My cat has had one stupid moment after another these past couple of days. Last night, he choked himself on the trash can in my bedroom, over and over again, trying to reach something inside. I had to get up at 4 in the morning and dump the contents into the "big trash" in the kitchen, so he'd give up and I could go back to sleep. Then the other day, he burned his tail on the stove -- that was smelly. He also landed on his HEAD while jumping for a toy last night. I must have added stupid pills to his food or something! Maybe the heat is starting to get to him. ~ I am in mega cookbook testing/writing mode right now, (I want to go with the momentum created by my workshop last weekend,) so if I don't get around to your blog as often as I usually do, know that that's why! I may also post less frequently. ~ I am going to start forcing myself to do yoga EVERY DAY to help with my sore back. Start harassing me. Please. I need lots of people checking up on me until I can make this a habit! ~ I had THE BEST pasta (vegan!) at the Good Earth restaurant this past weekend, (it was called "Tuscan Spa Pasta,") and I hope to post a review on Veggin' Out sometime this week. Watch for it! ~ I went to the store "Storables" last weekend, and I finally bought my hip granny shopping cart! I can't wait to try it out -- I might use it later this week to haul a load of laundry to and from work! I also picked up several other odds and ends. I am in love with that store. If Storables and Kitchen Window hooked up, my ultimate shopping experience would be born. (I like to be organized. I'm a nerd. When I was a kid, one of my favorite things to do was reorganize my desk. Sheesh.) Kai, thanks for the heads up on the location of granny shopping carts! Today's shopping . . .
being consumed by Party of One, but in a good way. I attended "Selling and Publishing Your Book" at The Loft today, and I have to tell you, words can't begin to describe how incredible it was. I learned so much about the publishing industry, everything from the huge changes that have been happening in the industry over the last couple of years, to the appropriate size box in which one should submit a manuscript. Just amazing. I walked out of the workshop with a 96-page handout, 8 pages of notes, and my instructor's business card -- he said we could call him any time with any questions, and if they took more than ten minutes to answer, he would offer his consulting services at a "pittance fee." My instructor mentioned that if you have the manuscript ready, submit the manuscript -- don't fuss around with a proposal. Since my manuscript is nearly ready, or at least I think it is, I am going to go this route. I will spend an exorbitant amout of money on boxes, paper, and postage by the end of the summer, I think. Here's my plan: I'm going to power through the rest of the manuscript for the next six weeks, and will hopefully have it finished by the middle to the end of August. When my nannying family goes out of town for two and a half weeks and I have a week and a half off and paid, I'm going to devote this time to writing the cover letter and marketing bits, researching potential editors/publishing houses, and then printing, boxing up, and shipping out 15 to 20 copies of my manuscript. Here's one catch to my plan: I'm starting to waffle a little bit about whether I have enough recipes. I counted them up tonight, and I currently have a total of 85 recipes, most of which I've tested and have had others test for me. I'm currently at 117 pages total, which includes table of contents/chapter pages, recipes, and text. I need to write a conclusion and the "Important questions, answered" section,(including "What in the heck is . . . " "How do I . . . " "Where can I get . . . " and "What to do with leftover . . . " I would also like to pull out what specific ingredients I would like included in the "glossary of major ingredients." (I also want an index of recipes by title at the end, but I think that will be the publisher's job.) I also have a handfull of recipes still to add, maybe less than ten, but I think with all of these changes, it will bring me up well over 150 pages. Just as a measurement tool, Vegan with a Vengeance has a total of 135 recipes and 258 pages, and that feels like a "smallish" cookbook to me -- not your giant "World Vegetarian" or VT Complete Cookbook or Vegan Planet. I don't want to write a ginormo, but I don't want people left wanting more, either. But, I also don't want to pad the cookbook with filler recipes just because I think it's too small. Waffle, waffle, waffle. Too bad I don't own a waffle iron, because waffles sound kind of good right now. I think I'm just going to go for what I have, plus my additions. If I get rejection letters that say "not enough recipes," well, we'll know the answer to this conundrum, now won't we? I also need to make a decision about photos. I really, really, really, really want a photo of each recipe included in the cookbook, which would increase its size by about fifty percent, and also increase the cost of the finished product to my readers. I want to do a paperback (maybe spiral-bound, so it lays flat,) but the photos could push the book price into the $30-$50 range, which would almost price me out of my niche market (young, probably broke, single people -- college students, young professionals, etc.) Here's the other thing about the photos -- I don't want them "styled." I want photos of the real thing, which I'm not sure a book marketer will go for. I have this idea of "food candids" in my head -- things with crumbs, things with bites out of them, bowls of soup with a splash over the rim and a dribble on the table, not-quite-perfect shots. Pictures of normal-looking young people eating my food. Kind of like the (probably really expensively orchestrated) incredible photography in Jamie Oliver cookbooks. I bought Isa's book mostly because I had heard so many wonderful things about it, but partly because it was less than twenty bucks, and I can afford that. I have to quit thinking about this now, or I'll never be able to sleep tonight. Off to watch a movie and clear my head! Now, I normally have a hard time getting veggies into my breakfasts, but today, it was easy, and I managed two veggie servings! Wowzers. I pan-fried a couple of soy sausage patties and half a sweet potato, thinly sliced, in a bit of canola oil until everything was softened and golden brown. I reheated a couple of leftover pancakes in the microwave, and then made a green smoothie! Yes, I was scared . . . but thanks to Megan blogging about a similar green smoothie, I decided to go for it! (I made mine out of a handfull of baby spinach, about a cup of frozen peaches, and enough orange juice to make the whole thing liquidy.) Yum! Add a cup of vanilla-almond black tea, and today, I am chowing a true breakfast of champions! a response from Seventh Generation! I knew they would . . . Thank you so much for letting us know of your unfortunate experience. Last year we had this problem for awhile, but we solved it, and I am very curious as to whether you have a batch of old bags, or if this problem is rearing it's ugily head again!! Would you take a look on the bottom of the box for the lot #? It will be hard to see - you will have to be in good light - the numbers will be stamped into the cardboard - 5 or 6 characters long. Anything after 1504 should be in great shape - if not, it's time to contact our manufacturer again!! Are you able to tell the cause of the ripping? Are the seams failing, or is the plastic thin? Are the drawstrings themselves OK? I apologize for all the mess - total yuck! Would you believe it? I wanted to post tonight, but I can't come up with anything remotely interesting to tell you. I didn't cook anything today, work was uneventful at best, and I'm stinking tired. Just know that the intent was there! The rest of this week looks busy for me -- I have a voice lesson tomorrow morning and then work all day, I work Friday and then am headed out Friday night for Michelle's birthday, and then I have my workshop at the Loft on Saturday! I can't wait for "Selling and Publishing Your Book!!!!!!" So, if you don't hear from me for a couple of days, that's why. Enjoy the rest of your week! And boy, were they tasty. P.S. I bought a copy of "Vegan with a Vengeance" today. I also saw "The Devil Wears Prada." (Actually, I bought the cookbook while I was waiting for the movie to start -- it was just sitting there at Borders, waiting for me to take it home!) I also went to Target (again. I forgot things.) I don't think I could have packed more fun into the afternoon if I had planned the whole thing out! Fireworks tonight, then back to work tomorrow, but it's only a three-day work week! Sweet. Thought I'd share a baking mishap story so you all don't think I'm a food goddess or anything -- not everything turns out perfectly in my kitchen every single time! Even though I made cupcakes the other night, I only made six, and they are almost gone (I gave away a couple, for taste-testing purposes,) and my peanut butter cookies are almost gone, and since I'm having major sugar cravings, I decided to bake some cookies tonight. Chocolate-Chip cookies were a no-go -- I'm out of chocolate chips. Oatmeal-Raisin cookies were a no-go -- I'm out of oats. Molasses cookies it was! I even found a yummy-looking Cooking Light recipe earlier today while cutting up magazines. So, I did a little math in order to cut the recipe in half, gathered ingredients, and preheated the oven. The first question for me is always, "what about the egg?" Tonight, I tried flaxwhip -- I pulverized a tablespoon of ground flaxseed and three tablespoons of water in my mini-prep until it was thick and gooey, and beat it in at the appropriate time. Other than subbing whole-wheat pastry flour for the AP flour, I followed the recipe exactly. I did not freeze the dough for an hour like the recipe said to, and I did not roll the dough into balls and then dip them into sugar -- I didn't feel like being fussy tonight. (I've skipped this step many times before, with fine results.) So, I scooped and baked. After about four minutes, I was smelling burning sugar, and peeked at the cookies -- they were gooey in the middles but done on the edges, so I turned the oven down by 25 degrees. Kept baking. Took them out, and they were thin, flat little molasses pancakes. I tried to get one off . . . they were too gooey, so I let them sit for a couple minutes. During this time, they nearly permanently adhered themselves to my cookie sheets. After lots of prying, the cookies were removed, severely bent out of shape, looking like normal cookies might look if they were taking a trip through the bendy mirror department of a fun house. They taste great! (Maybe a little too sweet . . . .) Texture is awesome, too -- crisp-chewy, just like a molassess cookie should be. Visual appeal = 0 however. The next two batches did the same thing, despite being started at the lower oven temperature. Frustrating. Cool, peel, and cut up the beets into about 1-inch cubes, or a little larger. Toss the beets and 1 cup thinly sliced red onion in the vinaigrette. Chill overnight before serving. This salad is a bit spicy from the raw onion, raw garlic, and raw shallot. Enjoy! Then, while the oven was still on, I whipped up a batch of Double-Chocolate Cupcakes -- I'm still tweaking this recipe for Party of One, and I think I've almost got it! They are plenty chocolatey enough, and they don't sink any more -- they aren't nicely rounded on top like a normal cupcake, but they suffice, I think. I made a test batch of my Creamy Vanilla Frosting for them as well, and then topped each cupcake with a slice of strawberry and a mint leaf. Cute and yummy! Fish out the bay leaves and thyme stems with tongs once the lentils are tender. Cool and freeze in small portions for a non-90-degree day! I still have a big bunch of fresh oregano leftover, as well as some mint, thyme, and Thai basil. (The basil may go into more spring rolls later this week.) Any suggestions? Oh, how I love fennel. Why did it take me 26 years to discover fennel? Anyhow, this recipe is courtesy of Cooking Light. I cut the original recipe in half, (adjusted amounts are listed here,) because six servings of any salad (even a really fabulous one) is too much for me! This salad is awesome -- salty, sweet, and sour. Mmmm fennel! It's also very pretty -- white, orange, green, and purple. I thought the lemon sections would be weird, but they aren't -- sour, but appropriately so. I have had paella once, back in my omni days, and remembered REALLY liking it . . . so when I stumbled across a recipe for "Quick Vegetarian Paella" in an old Cooking Light magazine, I decided to try it out! End notes: this could use a little more salt, and also benefited from boiling off a little bit of extra liquid at the end. Otherwise, pretty good! P.S. According to the recipe, it should have made about 2 1/2 servings . . . it looks more like four to me! Sheesh. I'm really glad I cut the recipe in half to begin with! I wanted to begin by thanking you for creating overwhelmingly fantastic products! I purchase and use several of your laundry, paper, and cleaning products on a regular basis, and am very impressed with their overall quality. I especially appreciate your company's philosophy, and that your all-natural products work just as well as their "conventional" counterparts! However, I recently purchased a package of your drawstring kitchen trash bags, and was very disappointed. This product did not live up to my previous experience of your company's quality. The bags leak and rip on a regular basis, requiring me to haul my entire garbage can out to the dumpster, instead of just the bag. (And afterwards, I have to scrub out the garbage can! Yuk.) I have temporarily solved this problem by double-bagging. However, this solution seems wasteful to me, and as a company who does everything possible to avoid waste, I wanted to let you know! I would be delighted if you were able to significantly improve the quality of your trash bags. I will continue purchasing them because they are the only recycled trash bags in my area, but hope that I will be able to discontinue double-bagging my garbage in the near future! Yes, I said I was going to make scones, but I made muffins instead. (It was hard to turn away from the homemade mix that was "already ready already" in the freezer. They were in the oven in five minutes.) These will go in the cookbook, and I made an apple-cinnamon version using, yes, you guessed it . . . diced apple and ground cinnamon. Rocket science. I also made granola -- after Jess was kind enough to test one recipe for me, I decided to change up the recipe a bit. My granola has always been a bit, em, heavy, if you will -- lots and lots and lots and lots of chewing. So I decided to lighten things up a bit by adding some brown rice puffs, and used walnuts and walnut oil, as well as maple syrup and some other "secret ingredients." Oh, if I had a camera . . . ! Before I started these cooking projects, I watched "Chasing Liberty." There is something I love to hate (or hate to love!!) about Mandy Moore movies. (She was pretty awesome in "Saved!" but her others have been silly but watchable.) It was as predictable as romantic comedies are, but I was hooked anyway. A pretty charming male lead (Matthew Goode) as well as hilarious secondary characters (played by Jeremy Piven and Annabella Sciorra) helped tremendously! I was going to write out the whole recipe for you (if you want it, you can follow the link above and search for "Spring Rolls,") but I discovered that the measurements in the recipe seemed WAY off to me. I didn't want my spring rolls to explode, so perhaps I skimped on the fillings . . . but they are still almost 2 inches fat! I also made a peanut dipping sauce for these (I didn't measure -- just sloshed and stirred until it tasted good,) out of peanut butter, tamari, mined shallot, sliced green onion, rice vinegar, and water. These are pretty and tasty, and could benefit from some added strips of red pepper next time for a little more color. :) Wrapping the spring rolls wasn't as hard as I thought it was going to be! Awesome snack. Dumplings: edamame, lemon juice, toasted sesame oil, cumin, salt, and wonton wrappers. I think the cumin in these tastes REALLY WEIRD -- I think I might try them next time with ginger. I fried/steamed up about 8 of them right away, and am freezing the others on a cookie sheet and will transfer them to a ziploc when they are solid for another day. I thought of cooking all of them all at once, and then I thought about how leftover dumplings might taste . . . chewy and ick. So I'll let you know if the freezing technique works! Off to work on the second round of dishes for today, then I might sit down for awhile before cooking something else! (I'm waiting until the sun goes down and the temperature drops a little bit before I turn the oven on -- it's in the nineties today!) More updates later! P.S. I really like my new recipe binder. 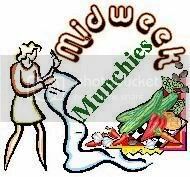 Here's the deal: I usually do my shopping on the weekend (either Friday night or Saturday morning, typically,) and write up my Midweek Munchies post when I get home, then save it and wait to post it until the following Wednesday. I've decided I'm not very good at waiting, thus, I am being a rebel and will be posting "Weekend Munchies" from now on! Plus this way, you get to see a preview of all of my goodies before hearing about cooking projects. Yes, there will be cooking projects this weekend. Many, many cooking projects. I will post recipes when I can! 1. I have decided to go through and chop up the gazillion food periodicals I have stashed in my desk (mostly, three year's worth of Cooking Light and Eating Well mags, as well as a few random VTs and RealSimples thrown in,) gluestick the recipes I actually think I might make to sheets of 3-hole drilled paper, and file them in a binder. Each recipe will get its own page, so there will be plenty of space for notetaking and whatnot. I started the chopping up process earlier this week, and started the gluesticking part today. I did not buy enough 3-hole drilled paper, and I think I'm going to have to buy two more binders by the time I'm done. (I've used up 100 sheets already.) Sheesh! However, I hope this new system will actually inspire me to use these new recipes! So far, it's working! 2. I will (hopefully) dig through my storage closet and storage locker, and pull out everything I plan on taking to Michelle's friend Trudy's house for her summer rummage sale, and load it all into bags into my truck. Once I trek out to Trudy's house and unload all of this stuff, I can begin the car-selling process. Wahoo! 3. I also have itty-bitty, odds-and-ends type projects hanging about, a mountain of dishes (as always,) and a bit of light cleaning to do. While this weekend won't necessarily be relaxing, I'm looking forward to getting a ton done!